Structural loads or actions are forces, deformations, or accelerations applied to a structure or its components. Loads cause stresses, deformations, and displacements in structures. Assessment of their effects is carried out by the methods of structural analysis. Excess load or overloading may cause structural failure, and hence such possibility should be either considered in the design or strictly controlled. Mechanical structures, such as aircraft, satellites, rockets, space stations, ships, and submarines, have their own particular structural loads and actions. Engineers often evaluate structural loads based upon published regulations, contracts, or specifications. Accepted technical standards are used for acceptance testing and inspection. Dead loads are static forces that are relatively constant for an extended time. They can be in tension or compression. The term can refer to a laboratory test method or to the normal usage of a material or structure. Live loads are usually variable or moving loads. These can have a significant dynamic element and may involve considerations such as impact, momentum, vibration, slosh dynamics of fluids, etc. An impact load is one whose time of application on a material is less than one-third of the natural period of vibration of that material. Cyclic loads on a structure can lead to fatigue damage, cumulative damage, or failure. These loads can be repeated loadings on a structure or can be due to vibration. Structural loads are an important consideration in the design of buildings. Building codes require that structures be designed and built to safely resist all actions that they are likely to face during their service life, while remaining fit for use. Minimum loads or actions are specified in these building codes for types of structures, geographic locations, usage and materials of construction. Structural loads are split into categories by their originating cause. In terms of the actual load on a structure, there is no difference between dead or live loading, but the split occurs for use in safety calculations or ease of analysis on complex models. To meet the requirement that design strength be higher than maximum loads, building codes prescribe that, for structural design, loads are increased by load factors. These load factors are, roughly, a ratio of the theoretical design strength to the maximum load expected in service. They are developed to help achieve the desired level of reliability of a structure based on probabilistic studies that take into account the load's originating cause, recurrence, distribution, and static or dynamic nature. The dead load includes loads that are relatively constant over time, including the weight of the structure itself, and immovable fixtures such as walls, plasterboard or carpet. The roof is also a dead load. Dead loads are also known as permanent or static loads. Building materials are not dead loads until constructed in permanent position. IS875(part 1)-1987 give unit weight of building materials, parts, components. Live loads, or imposed loads, are temporary, of short duration, or a moving load. These dynamic loads may involve considerations such as impact, momentum, vibration, slosh dynamics of fluids and material fatigue. Live loads, sometimes also referred to as probabilistic loads, include all the forces that are variable within the object's normal operation cycle not including construction or environmental loads. Roof and floor live loads are produced during maintenance by workers, equipment and materials, and during the life of the structure by movable objects, such as planters and people. Bridge live loads are produced by vehicles traveling over the deck of the bridge. Environmental Loads are structural loads caused by natural forces such as wind, rain, snow, earthquake or extreme temperatures. A load combination results when more than one load type acts on the structure. Building codes usually specify a variety of load combinations together with load factors (weightings) for each load type in order to ensure the safety of the structure under different maximum expected loading scenarios. For example, in designing a staircase, a dead load factor may be 1.2 times the weight of the structure, and a live load factor may be 1.6 times the maximum expected live load. These two "factored loads" are combined (added) to determine the "required strength" of the staircase. 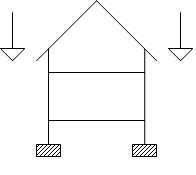 The reason for the disparity between factors for dead load and live load, and thus the reason the loads are initially categorized as dead or live is because while it is not unreasonable to expect a large number of people ascending the staircase at once, it is less likely that the structure will experience much change in its permanent load. For aircraft, loading is divided into two major categories: limit loads and ultimate loads. Limit loads are the maximum loads a component or structure may carry safely. Ultimate loads are the limit loads times a factor of 1.5 or the point beyond which the component or structure will fail. Gust loads are determined statistically and are provided by an agency such as the Federal Aviation Administration. Crash loads are loosely bounded by the ability of structures to survive the deceleration of a major ground impact. Other loads that may be critical are pressure loads (for pressurized, high-altitude aircraft) and ground loads. Loads on the ground can be from adverse braking or maneuvering during taxiing. Aircraft are constantly subjected to cyclic loading. These cyclic loads can cause metal fatigue. ^ ASCE/SEI 7-05 Minimum Design Loads for Buildings and Other Structures. American Society of Civil Engineers. 2006. p. 1. ISBN 0-7844-0809-2. ^ "1.5.3.1". Eurocode 0: Basis of structural design EN 1990. Bruxelles: European Committee for Standardization. 2002. ^ Avallone, E.A. ; Baumeister, T. (eds.). Mark's Standard Handbook for Mechanical Engineers (10th ed.). McGraw-Hill. pp. 11–42. ISBN 0-07-004997-1. ^ "2.2.1(1)". Eurocode 0: Basis of structural design EN 1990. Bruxelles: European Committee for Standardization. 2002. ^ "1604.2". International Building Code. USA: International Code Council. 2000. p. 295. ISBN 1-892395-26-6. ^ "2.2.5(b)". Eurocode 0: Basis of structural design EN 1990. Bruxelles: European Committee for Standardization. 2002. ^ Rao, Singiresu S. (1992). Reliability Based Design. USA: McGraw-Hill. pp. 214–227. ISBN 0-07-051192-6. ^ 2006 International Building Code Section 1602.1.